This one might have been more appropriate to post around Super Bowl time… but really, we’re not fans of “the game” like we are fans of the Olympic Games. I don’t usually like to eat in front of the TV, but these two weeks are definitely the exception. This is a great meal to cozy up to – it’s warm & delicious, and conveniently all in one bowl. Plus, it won’t make you feel too unhealthy while you watch all of the teeny girls (and guys) skate across your living room. Make a big batch and eat the leftovers all week. Heat oil in a medium-large pot over medium heat. Add the onion, garlic, a few pinches of salt and cook until translucent (5 minutes or so). Add chili powder, ½ the sliced chiles, and stir. Cook until fragrant (about 30 seconds), then add the vinegar, followed by the tomatoes. Stir, then add the broth and the sweet potato cubes and beans. 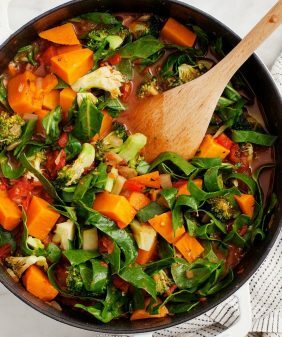 Simmer on low heat until the sweet potatoes are tender (about 20-30 minutes). Add the kale and corn and simmer for 5-10 more minutes. Add a good squeeze of lime. Taste and adjust seasonings - adding more salt and pepper as needed. Serve topped with scallions, crunchy tortilla strips, toasted chiles, diced avocado and extra lime slices. If you don't have dried chiles, just add extra spices: ie, more chile powder, cumin and/or coriander... and/or a diced chipotle from a can of chipotles in adobo would be a nice substitution. I used Muir Glen's fire roasted tomatoes with green chiles, but regular fire roasted tomatoes would be fine. (Diced plain tomatoes, in a pinch, would also work). This one tastes great (maybe better) the second day - make a big batch and store leftovers in the fridge for 2-3 days, and in the freezer beyond that. Loving this chili! 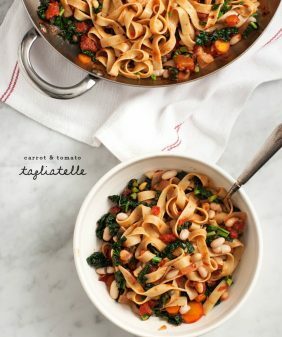 It looks fabulous and super hearty! This is my kind of chili. I’ll eat this type of meal all winter long! This looks absolutely scrumptious! Love the addition of kale. You clever sneaky girl! I love that you added some greens to this! Looks wholesome, colourful and delicious! Super budget friendly too. I look forward to trying this. Super affordable – thanks Trini! what size cans of tomatoes? the 14 oz fire roasted and diced? yes, exactly – thanks for catching that. I used Muir Glen’s fire roasted with green chiles, but regular fire roasted would work just fine. This hits all the right notes; spicy, sweet, a bit zesty, hearty but fresh, all in one bowl. 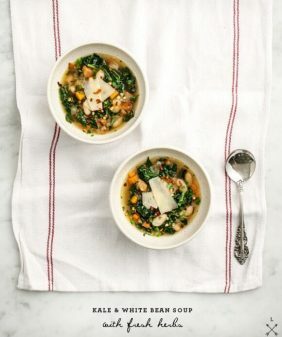 I could definitely see myself cozying up to an oversized bowl of this for the next week or two. Or three. 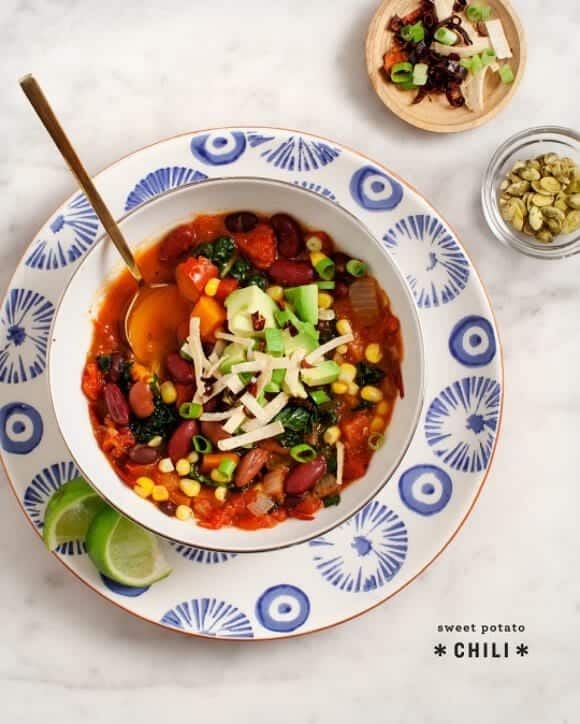 I love a good vegetarian chili. Filling and healthy. 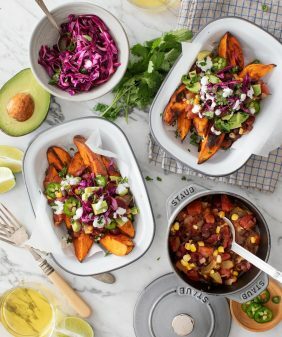 I’ve never heard of sweet potato chili! That sounds so good! 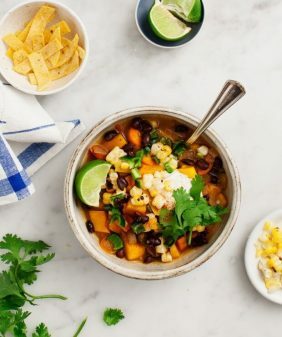 I am always looking for new sweet potato chili recipes because this is the only way I like sweet potatoes. And I’ve been meaning to eat more beans, so this recipe is great! Where are the blue and white plates from? They are so pretty and I desperately need new plates! once again since i have book-marked it. Great post. I used to bbe checking continuously this weblog and I am impressed! such information a lot. I was looking for tyis particular info for a vsry lonhg time. Hi there! I’m just wondering if you ever have made this in a slow cooker? I’m wondering if you’d need to adjust the liquids at all or anything to make it work… Thanks! 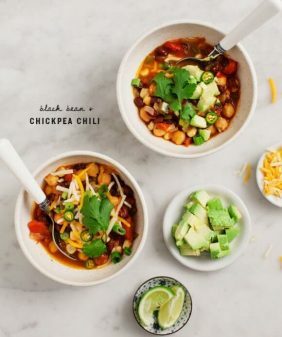 Made this last night – it was very tasty (I added some more spices, including a chili-lime seasoning, New Mexican hot chiles, and cumin) but I did not use ANY vegetable broth. I don’t really know why the recipe called for it in the first place, but my end result was very hearty and filling! I made it … I actually did 4 cups of sweet potatoes and 1.5 cups of corn – not even changing the amount of broth and it still had good chili consistency. I used trader Joe’s brown tomatoes, roasting them in the broiler to replace the canned ones. Pretty yummy. Hi Angela, I’m so glad it was a hit with everyone! 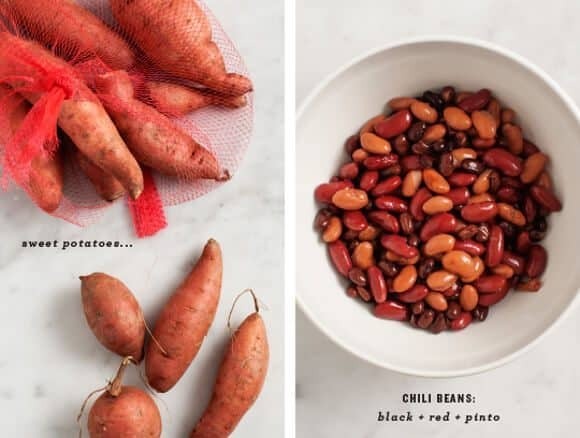 Thanks for leaving your Instant Pot tips – so helpful!